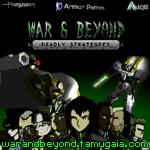 Tamugaia.com presents the Ultimate Flash Strategy Game - War and Beyond Deadly Strategies! The Ultimate Flash Strategy Game from Tamugaia - War and Beyond Deadly Strategies! 4 houses - Manpower, Firepower, Alien Tech, Trade Secrets. 3 strategies - Resources, Army, Defense Systems. 2 objectives - Attack and Defend. 1 war - War and Beyond.